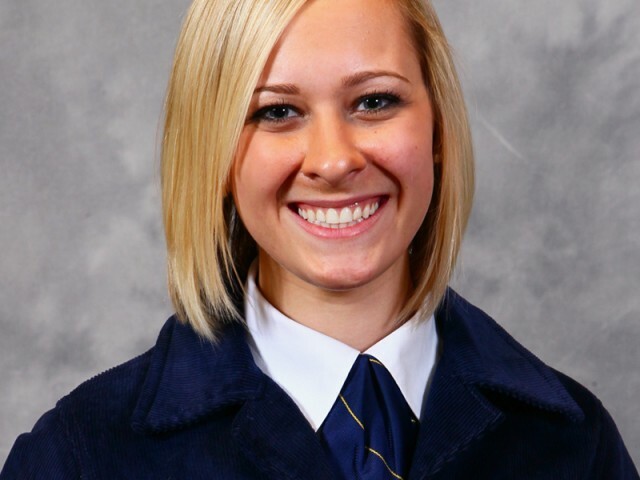 Sydney Snider, a CFAES Agricultural Communication major from Moscow, Ohio, was recently elected eastern region vice president for FFA. She’ll serve on the 2015-16 National FFA Officer team along with students from Arkansas, Tennessee, Iowa, Georgia and Utah. The new team was elected on Oct. 31 in Freedom Hall in Louisville, Kentucky, during the 88th National FFA Convention & Expo. Each year at the National FFA Convention & Expo, six students are elected by delegates to represent the organization as national FFA officers. Delegates elect a president, secretary, and vice presidents representing the central, southern, eastern and western regions of the country. National officers commit to a year of service to the National FFA Organization. Each travels more than 100,000 national and international miles to interact with business and industry leaders, thousands of FFA members and teachers, corporate sponsors, government and education officials, state FFA leaders, the general public, and others. The team will lead personal growth and leadership training conferences for FFA members throughout the country and will help set policies that will guide the future of FFA and promote agricultural literacy.